DS Lucy Black is called in to investigate. As Lucy delves into the community, tensions begin to rise as the man's death draws the attention of the local gay rights group to a hate-speech Pastor who, days earlier, had advocated the stoning of gay people and who refuses to retract his statement. Hatred and complicity abound in the days leading up to the Brexit vote in McGilloway's new Lucy Black thriller. 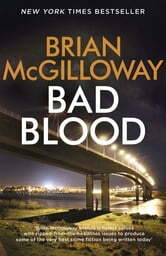 Compelling and current, Bad Blood is an expertly crafted and acutely observed page-turner.